A rated cigar for less than $4.00! My go to , everyday smoke. Great cigars would recommend you try them. Smooth and mild yet rich in flavor. Have not had a friend that didn't enjoy them. Great service, delivery, and price from Best Cigar Prices as well. When lucky enough to find one that is without sticks and stems this is an excellent medium bodied smoke. The dark Oscuro wrapper adds just a little bite of spice to go with the rich coffee undertones. El Rey Del Mundo Robusto Larga is rated 4.3 out of 5 based on 8 customer ratings. Rather than a box of 20, can I buy a smaller amount of the el rey del mundo robusto larga? At this time we carry the El Rey Del Mundo Robusto Larga(6x54) only in boxes of 20. 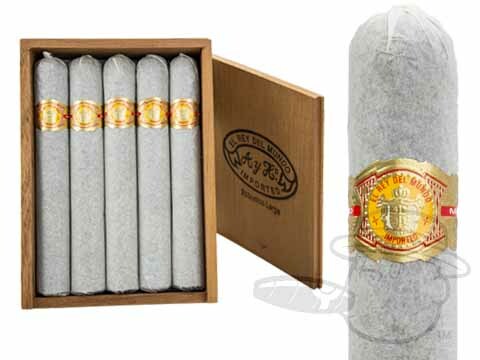 We do, however, carry the El Rey Del Mundo Robusto (5x54) in a 5 pack.